YouTube now is the most popular video sharing site on the internet, where you can find any type of videos and movies. Sometimes you may want to save your favorite videos for offline watching but YouTube doesn’t provide a download feature. What should you do? Well, you can either install a third-party tool like Gihosoft Total Video Converter for the job, or you can use online sites to easily save YouTube videos without any software or application. In this article, we’ve curated the top 10 best YouTube video downloader online services which can be easily accessed through your web browser. All these YouTube downloader online sites are completely free and simple to use. Just read on and pick the one you like most to download the YouTube videos you desire. OnlineVideoConverter has been one of the most dependable YouTube downloader online for a while now and definitely still remains one you can trust to help you download youtube videos. It has earned its place to be amongst the best YouTube downloader online thanks to its ability to download and convert YouTube video links to various formats including MP3, MP4, AVI, M4V, MOV, FLV, MPG, WMV, ETC. Plus, it supports not just YouTube but other video sites including Facebook, Instagram, Vimeo, Dailymotion, Break, VK, and more. Just enter the URL of the video you wish to download, hit “Start” and you’re good to go! Very easy to use, unlimited downloads and conversions for free. Fully compatible with all modern web browsers. Offers high speed downloads and superior quality conversions. Does not require to install any additional software, and no registration required. Doesn’t download videos directly to your device, you’ll receive a download link instead. QDownloader.net is one of the best YouTube video downloader online, which allows users to easily download videos from YouTube in MP4, FLV, 3GP and many other formats. Apart from YouTube, it supports over 800 websites from which you can download videos and movies, including Facebook, Instagram, Vimeo, Liveleak, BiliBili, etc. Very easy to use, and provides fast download speed. Supports to download videos from YouTube and other 800 websites. No additional software is required to install. Impossible to optimize videos for mobile devices. Savefrom.net is one of my favorite free YouTube downloader online. It allows you to download a YouTube video simply by entering its URL into the search bar. This free online YouTube video downloader also can be used to save videos from Facebook, Vimeo, Veoh. Twitch, Soundcloud, Ted, etc. Besides, it even gets better by providing a add-ons browser extension to download YouTube videos in one click. Provides very easy way to download videos. Lets you download YouTube videos with high quality. Compatible with many video sharing websites. The add-ons mostly dependent on third-party websites which can come with serious disadvantages. Y2mate.com is a great place to go if you are looking for an online YouTube video downloader that can get the job done. It allows you to download and convert videos from YouTube, Facebook, Vimeo, Dailymotion, etc. to MP4, MP3 in HD format. Y2mate supports downloading YouTube videos in all formats, including MP4, M3V, 3GP, WMV, FLV, MOV, MP3, WEMB, etc. Unlimited free video downloads and conversions. Supports a wide range of output formats. Completely free, doesn’t require registration to use its all features. Apowersoft Free Online Video Downloader is one of the quickest and most reliable YouTube video downloader online tools that is available for free. You can download videos in various formats such as MP4, 3GP, FLV, WMV, MP3, WEBM, MOV, etc. with high quality. It is very easy to use, all you have to do is to copy and paste the URL of your desired YouTube videos. Fully compatible with all popular browsers like Google Chrome, Firefox, IE, etc. Search function makes it easy for you to find more cool videos. Requires no installation, no signup or even no fees. It is impossible to pause download. YouTubNow is one of the most convenient way to download your favorite YouTube videos as well music tracks quickly and absolutely for free. This reliable free YouTube Video/MP3 downloader online tool not only works to download videos from YouTube, but also from many other websites. You can either either enter the video URL to download, or enter an exact name or a keyboard in the search field to find your targeted video. Supports different video formats and resolutions. Gets soundtrack out of a YouTube video and save as MP3 or M4A. Fast video download speed with original URL substitution. Provides a good FAQ section to answer the most frequently asked questions. It can take a bit more time to complete the download process. 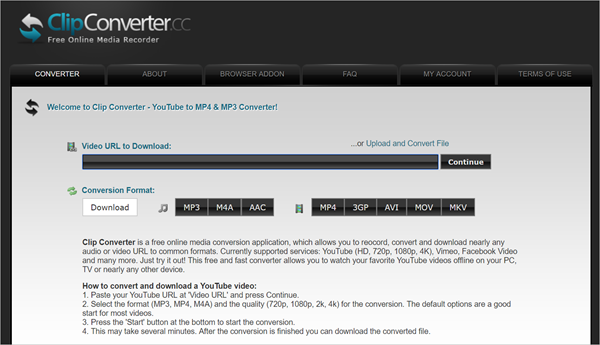 Convert2MP3.net is a simple yet powerful YouTube Downloader online that actually works. And yes, the output is great as well. This easy to use free Youtube Video Downloader supports a video search option and allows you to copy & paste video links from a host of websites from the web like YouTube, Dailymotion, Clipfish etc. And you can directly convert YouTube video to your desirable format like MP3, MP4 and more. Fast, free and no registration needed. Download videos to your hard drive or save it to Dropbox. Some video formats such as AVI have time limits. Supported websites not very extensive. ClipConverter.cc is not just a media conversion tool for converting videos in different formats. Also it acts as a great free YouTube Video Downloader tool that you can use to download videos from YouTube and convert YouTube videos to any video format of your choice. It is very simple to use. Just copy the video URL, choose the video quality and file format, then hit Start. Supports video downloading of high definition like 720Pp, 1080p and even ultra HD 4k. Provides plugin for Chrome, Safari and Firefox to easily download YouTube videos without visiting the site. Supports a wide range of websites like YouTube, Vimeo, Facebook etc. It can be picky about downloading videos that contain music. Video Grabber is another top rated free YouTube Video Downloader online tool, which allows you grab and save online videos from YouTube, Vimeo, Break, Dailymotion and other 1000+ video sites. Search by keywords or use the URL, you can free download your favorite online videos straight to your computer in your preferred formats like MP4, FLV, 3GP, WMV, WEBM, MP3, etc. Allows you freely manipulate video settings for resolution, frame rare, sample rate, channels and subtitles. Allows you download & convert videos for portable devices such as Android, iPad, iPhone, PSP, etc. Screen recording function lets you record anything on your computer and save it as a screenshot or a video file. It can become overwhelming to use for the naive. Catchvideo.net is another free YouTube Video Downloader that you can use online without installing any additional software. The site works very effectively, all you have to do is enter or paste a URL in the textbox, then click the Catch button to download videos form YouTube, Facebook, Dailymotion, Vimeo and various other video websites. No registration or addition software is required on this website. Allows downloading videos from many different sharing sites around the web. The video downloading process can be very slow at times. As you can see, there are many YouTube video download online service available on the Internet. With the above list, I hope you’ve found the best YouTube download online tool to download and grab your favorite videos for your viewing pleasure. Please note that YouTube’s terms of service explicitly prohibit unauthorized downloading. So we suggest you should only download YouTube videos when you have the copyright owner’s permission to do so.